The O’Neal School Varsity Golf Team won the Eastern Plains Independent Conference (EPIC) Championship on Wednesday, April 27th. O’Neal’s Fulton Smith ’19 was the top scorer as the team claimed three of the top five individual places. Hosted by Cary Christian School, the tournament took place at Prestonwood Country Club in Cary. The team finished with a cumulative 5-shot lead over St. David’s School, who has held the championship title for consecutive years. Team scores are: O’Neal - 273; St. David’s -278; Grace Christian School of Raleigh - 312; Cary Christian School - 334. O’Neal individual scores are: Fulton Smith ‘19 - 65 (1st place); Jackson Van Paris ’21 – 68 (3rd place); Drew Martin ’17 – 69 (4th place); Joey Pritchard ’20 - 71; Brian Subin ’16 – 79; Ryan Pollat ’18 - 93. O’Neal Varsity Golf Coach Brian Anderson was also titled 2016 EPIC Coach of the Year. "I am extremely proud of the young men on the team this year,” says O’Neal Varsity Golf Coach Brian Anderson. “Each one has continually improved throughout the season and have all contributed to the success of the team this year. The maturity of such a young team, led by senior Brian Subin and junior Drew Martin, has been extremely impressive to watch. The team looks to be in solid form and know we will have some tough competition at the state tournament." Finishing their regular season schedule as the #1 team in the state in addition to the conference championship win, the team is hopeful for a strong appearance at the NCISAA 2A State Championships May 15th -17th hosted by Westchester Country Day School at Willow Creek Country Club in High Point. 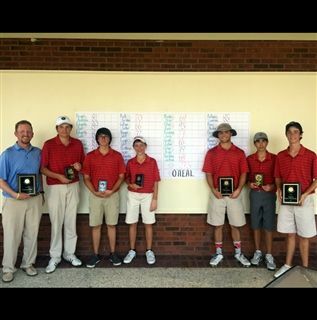 To read more about O’Neal’s Varsity Golf season, click HERE.